Second Night is HALF PRICE! Arrive Monday and receive Thursday night FREE! Does not apply to the Bargain Basement.August & September are the best months for viewing hummingbirds in Highlands! The babies are hatching and there are families of the cute little creatures buzzing all over the porch where we have added seven new feeders to see if that would attract more hummers. Well, it did and they also buzz red hats, shirts, or lipstick! They’ll be with us until mid-September or beyond when they begin their fantastic journey south. This great photo was taken last year by one of our guests. 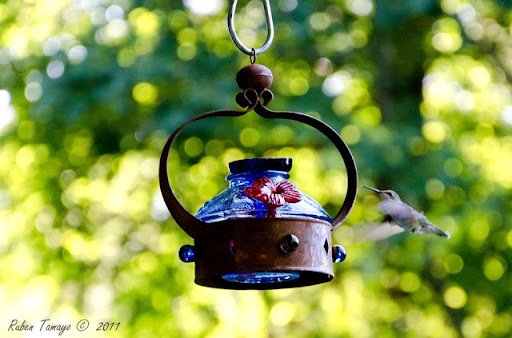 Our feeders, like the one above, are from PARASOL and are made from recycled glass. They come in many designs and beautiful colors. This one is called “Camelot.” We have a few of these (and a couple of other designs) to sell, but we don’t ship. You’ll have to come to the Inn to make a purchase. The best idea is to be our guest and spend some “porch time” where you can see them in action! Buzz on up to Highlands and say goodbye to our little friends!